Is there any correlation between La Niña/El Niño and seismic activity? I've read in the past that extreme precipitation levels may have an effect on seismic activity, and wondered if anyone has ever analysed the La Niña / El Niño cycles to see if there are any correlations with seismic activity in the area affected by the phenomena. Months with the greatest number of earthquakes or months with earthquakes that release the greatest amount of energy precede the onset of El Niño events. 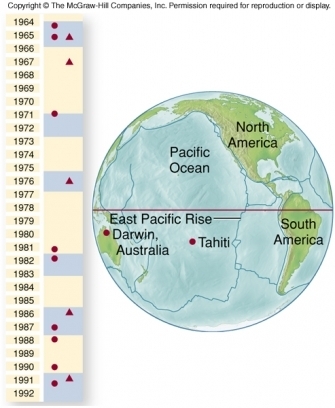 This hints at a relationship between seismic activity and El Niño events. A simple statistical analysis suggests that if the seismic events and the El Niño events occurred randomly, the probability of finding a sequence in which periods of heightened seismic activity precede El Niño events would be 1 out of 313. Such long odds imply that the sequence probably is not generated by random chance. Rather, there may be a physical connection between seismic activity and El Niño events. But statistical correlation should not be confused with physical causation. Correlation indicates that the timing of the two events is similar but does not mean that the two events are connected. Scientists have come up with several explanations for how seismic activity may trigger El Niño events. These hypotheses are based on the relationship between air temperature and pressure. In general, warm air has less pressure than cold air, so hypotheses seek to explain how seismic activity along the East Pacific Rise could affect air temperature. There are several other articles that discuss the relationship between La Niña/El Niño cycles and seismic activity, such as this article published by RSTA entitled Statistical analysis of the El Niño–Southern Oscillation and sea-floor seismicity in the eastern tropical Pacific. There also appears to be a relationship between El Niño cycles and volcanic activity, as published in Nature. Not the answer you're looking for? Browse other questions tagged geology weather seismology precipitation enso or ask your own question. Does the climate have any effect on plate tectonics? Can large (and wet) storms really trigger large magnitude Earthquakes? What is the methodology to analyze future climatic extremes using the results of climate models? Is there a correlation between hot springs and earthquakes? Earthquakes in Oklahoma influenced by Humans? What is this “hole” that blows sand into the air? Can El Niño and La Niña occur at the same time? How many extreme shifts in climate has Earth gone through in its existence?